Kurpie and its surroundings lie in the north-eastern sector of the Mazowiecka Lowland. At one time, centuries ago, this part of Poland was covered by an extensive forest known as the Green Forest. Nowadays, instead of one large forest, there are many woodland complexes of various sizes, interrupted by meadows and fields, covering a total area of 500 km2. The five main rivers of the Kurpie region are: the Narew, Pisa, Szkwa, Rozoga and Omulew. Besides the rivers and streams, the region abounds in ancient river-beds and bogs. Within the area one can find not only nature at its most beautiful, but also interesting towns like Ostroleka and Myszyniec. The latter serves as a centre of Kurpie culture, with a number of festivals being celebrated throughout the year. Traditional folk art of the region is reflected mostly in the architecture, weaving, carving, ornaments and paper cut-outs. Many old customs are still practised and the regional dialect continues to be spoken among the locals. 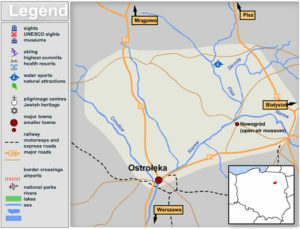 Ostroleka, the region’s main city, lies 115 km from Warsaw. Hence, it is advisable to fly to Warsaw first and then continue your trip by train, bus (PKS) or car. It takes approximately 2.5 hours to get to Ostroleka from Warsaw. For those coming by car, the most important route is road no. 61 from Warsaw to Suwalki and on to the Baltic countries. Used to reach Masuria from Warsaw, road no. 53 also traverses the region of Kurpie.